As a Skratch Labs Taste Agent and Rock n' Blog member, I was sent books from Velo Press for review and giveaway purposes. I was not compensated in any other way. Today is Try Out Thursdays Link Up Volume 2! Hope you have some fun product reviews to link up! Details on how to do it are the bottom of the post! I have never made it a secret that I love Skratch products! 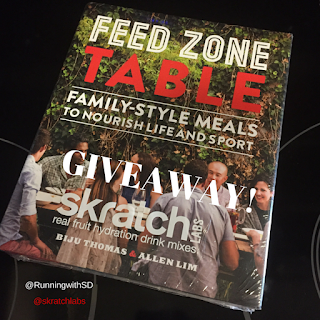 But then, Skratch came out with a brand new cookbook - the Feed Zone Table! 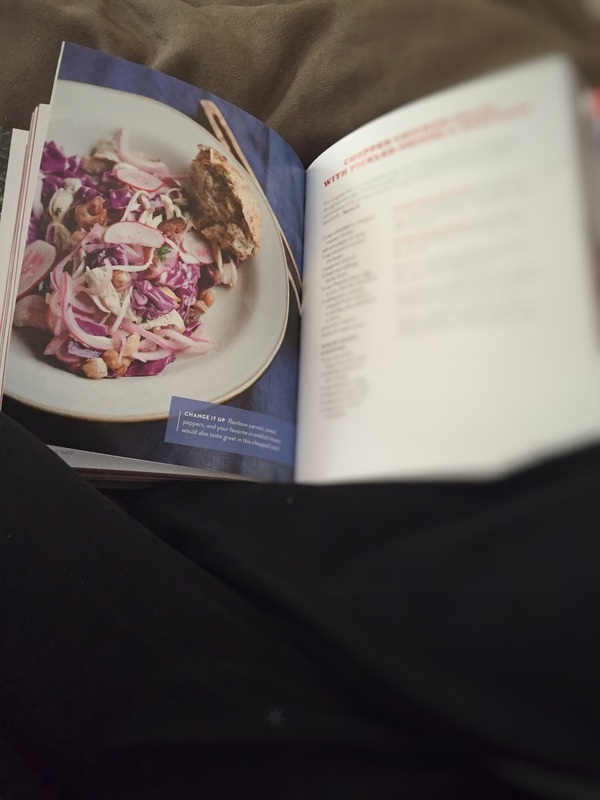 It contains 100 recipes designed to bring friends and family to the table! 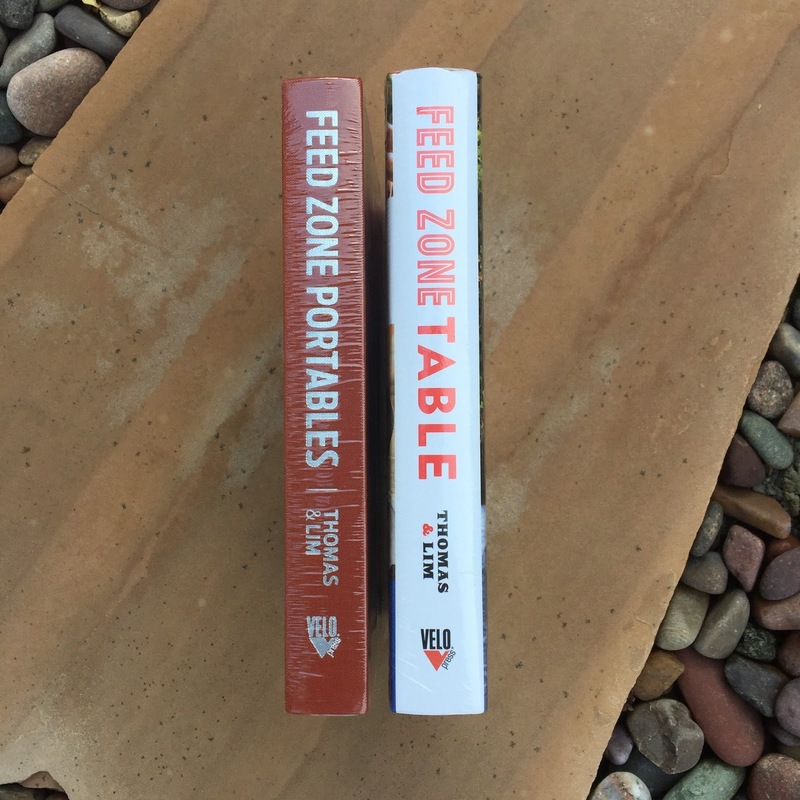 Skratch has some pretty awesome books already like Feed Zone Portables designed for athletes who want real food on the go! But this one - Feed Zone Table? Has my heart and my belly! I love to cook and I miss cooking because I never have enough time. So when I got to pick my book, I chose this one to review. And I knew right away which recipe I wanted to make! The Chicken Chopped Salad with Pickled Onions & Radishes! It let me play with ingredients I have never used in cooking before like figs. And I learned the technique for quick pickling onions and radishes. The colors in this salad were spectacular! And the flavors? DELICIOUS! I am so happy with how it turned out. My husband loved it too! Healthy, flavorful and filling! Did I mention it has pan roasted chickpeas in it too? The best thing about this book is that it has recipes for everyone. Not just athletes. It addresses the Diet-Health paradox. Recipes for people who want to take an interest in what goes into their bodies. Things like Lemon Hibiscus Iced tea with Honey, Chilled Black Bean Yogurt Soup, Baked Jambalaya and even Banana Mousse Dessert! So much good stuff and now, I am giving one of you a chance to win your own copy! Enter on the Rafflecopter! If you don't want to wait to see if you win, head over to Skratch Labs and order your own copy. They will even throw in a box of their cookie mix! All winning entries will be verified. If a winning entry cannot be verified as completed, a new winner will be drawn. SD Mom not responsible for the failure of USPS to deliver product. But let's get back to the super awesome Try Out Thursdays Link Up! So ready to link up? Wanna win the Feed Zone Table cookbook? Tell me what you linked up. Tell me the weirdest ingredient you have ever cooked with. I think the weirdest ingredient I have ever cooked with would be ginger. The ingredient itself isn't weird, but I find it hard to cook with! Lavender in a smoothie! I have used maple syrup in breakfast casseroles. I love trying new recipes. What an awesome giveaway! I really like cookbooks and want to explore more new healthy recipes! That salad looks incredible! I think the strangest thing I've cooked with was for me, butternut squash! I just didn't know what the heck I was doing, but it turned out delicious! That definitely sounds like an interesting cookbook. I'm not a big fan of radishes, but that recipe sounds interesting enough I'd still try it. Maple syrup in it? I'm always open to trying something new. We keep it pretty basic around here so no crazy ingredients! I like to try new recipes but we tend to recycle the same recipes over and over. I make a salmon glaze that has maple syrup in it...yum-o! That recipes sounds absolutely amazing. I love the idea of so many flavors and the crunch of the quick-pickled veggies. I am definitely going to have to check this book out! I love cooking new things. My favorite time to cook is when I find inspiration in an ingredient or when I'm really hungry and we have odd things/combos at home...I love using food to bring my family to together. I really hope I win! The strangest ingredient I've worked with --> beets, raw beets! I didn't realize how hard it was to cook them. But they are so good! Sounds delicious! I may have to check it out! I always like simple recipes... like many professional women, I'm time strapped, but want to eat healthy, tasty food! :) Thanks for the review and the great pictures. That salad looks yummy! I love cookbooks! The weirdest ingredient I've used is probably lemongrass. Wow was it ever tasty! Thanks for the linkup! I really like the skratch drink and I have looked at the portables cookbook before but haven't bought it. This book looks even better than the portable and I'm definitely going to have to buy it. Thanks for this great review! I think anise is a weird ingredient. I like trying new things. I tend to make the same things over and over, but I also like to try new things. And this isn't really "strange," but I had my doubts at the time -- now it's a new favorite: Broccoli slaw with spicy peanut dressing. I need this cookbook!!! The weirdest ingredient I ever cooked with was tempeh. But ooooh was it yummy!! When I tested the Green Blender smoothie service, there were some really strange ingredients in there--things I never heard of! It's always fun to try new foods, isn't it? I make avocado pudding all the time. People always give me a strange look when I talk about it, but it's bomb! Everyone should try it! I made easy things, like with 5 ingredients or less, but I switch out veggies &/or proteins. I hate complicated recipes with 50 ingredients lol. I dont think i've cooked anything particularly weird. I enjoy cooking new recipes. I don't think I've ever cooked with anything weird. We tend to stick to the same things but we are starting to eat more at home and eating better so I have been branching out more for our meals! Tofu.. it was not good. I love cooking new recipes! I try at least one new recipe each week & then rotate our family favorites!